I wanted to look at the market data concerning ccTLDs and their performance on different international versions of Google. I wanted to know whether ccTLDs demonstrated any tendency of outranking sites with gTLDs (as defined here) that had a greater DA or PA. If ccTLDs did demonstrate this trait, then perhaps there is merit in selecting them over subfolder structure. If not, and the ranking of websites on SERPs shows the general trend of order by DA/PA, then surely there is no reason to structure an international website with a ccTLD and the best option is to consolidate all links on one site and geo target the subfolders. I understand that there is more to this decision if we take into account the user’s preference to interact with local domain websites. We’ll touch on that point later. For now, I just want to focus on how Google seems to treat ccTLDs. Then, I decided to identify 10 keywords for each category in each market. 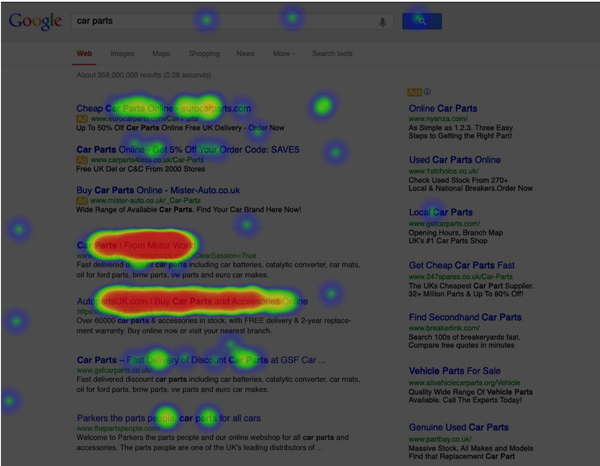 Keywords were selected by inputting a broad keyword into AdWords for each category (say, “game”), filtering by search volume, and selecting the highest search entries that had an average AdWords suggested bid of higher than £0.05 which would provide terms that had high search volume and commercial relevance. Let’s start with the obligatory “correlation does not equal causation.” Nothing discovered in this research will definitively prove or disprove ranking factors for international SEO. However, I believe that this kind of research does throw up interesting data, and any SEO trends and correlations discovered through this type of research can set us on our own path to research further and look for more concrete signals to prove or disprove these results. 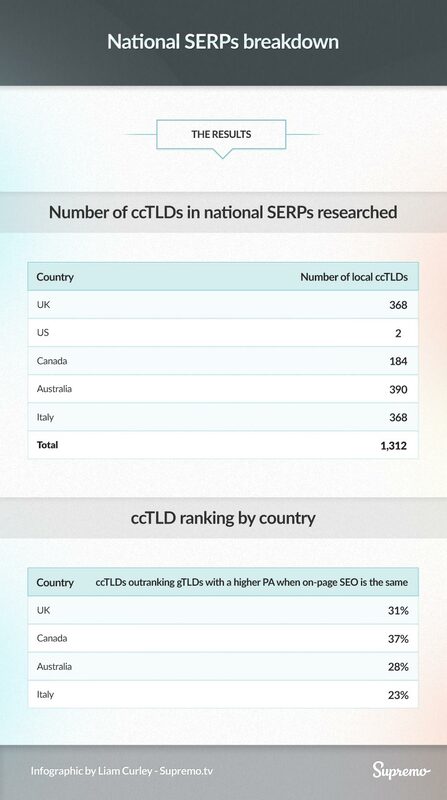 ccTLDs are not outranking gTLDs. Graphs 1 and 2 demonstrate that the majority of ccTLDs are not outranking gTLDs that have a higher PA. Graph 1 shows that 46% of ccTLDs reviewed outrank a gTLD with a higher PA. However, when we only count “outranking” to occur when both the ccTLD and the gTLD have the same basic on-page SEO (e.g., keyword in title, URL and/or domain), we see that the percentage of ccTLDs outranking gTLDs falls to 24 percent. A Local IP address doesn’t pack a punch. Again, this research can’t definitively determine whether an IP address does or doesn’t provide ranking signals for national SERPs, but Graph 5 suggests that if it does, the signals are weak. Of the 474 ccTLDs with a local IP address, only 19 percent were outranking a gTLD with a higher PA. This figure suggests that an IP address has little direct impact on rankings, even when combined with a local ccTLD. That said, it’s worth checking out this article on IP host location from Richard Baxter, which presents a different finding. It is difficult to make an accurate, broad statement on best practice for international SEO. Every market is likely to be slightly different with regards the way that users interact with content, as well as the way that search engines crawl and rank web pages. You also have to take into account that if you’re working with a client on SEO for different international markets, goals and resources will vary. Toys “R” Us does very well in the SERPs we analyzed with a ccTLD structure, but then they have the resources available to support multiple domains and earn local authority and PR for each domain. choice of buying or browsing on one site over another? eCommerce site with a local domain rather than a generic domain (U.S. excluded). regarding eCommerce and the impact of ccTLDs on purchase decisions. offer the most reliable express shipping to your home?” The respondent was then asked to select either a website with a .com domain, or one with a local ccTLD. the local domain. Real-life buying decisions don’t work like this. one website over another to purchase a product. The research also shows how important the meta description is in the user-browsing decision, something that I think often gets overlooked by SEOs. In fact, 30 percent of our respondents indicated they made their selection based on information provided in the meta (mentioning things like free delivery, range of stock, and discounts). I think that when we get a website ranking for a really important keyword, SEOs can be a bit like the football (or soccer) team that’s just scored a goal. We’re so engulfed in the success of scoring that we switch off at kickoff, letting the other team score straight away. There is a danger that we think we’ve won when one of our web pages ranks well, when in fact that’s just part of the job. We still need to compete for the user’s attention once we’re on the SERP, and entice them to click on our website instead of the competitor’s. 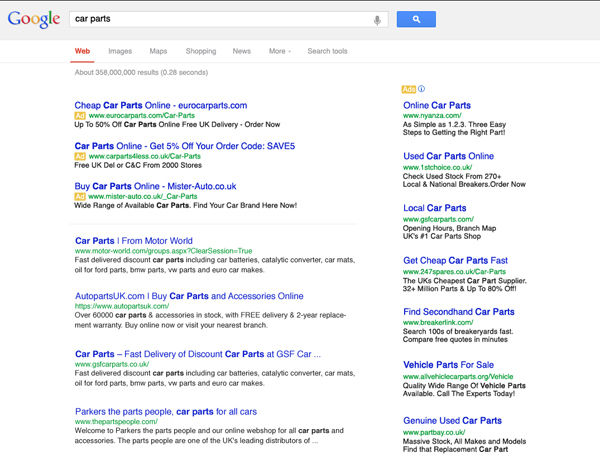 The research on consumer psychology does show that a ccTLD can have a positive impact on SERP user selections. However, meta descriptions can also be used to promote local service and delivery. The changes announced by Google for mobile SERPs will remove URLs from the selection equation, and we’ve seen that when a user is on a website, they pay little attention to the domain location.